This chocolate covered strawberries recipe will enable you to make beautiful mouthwatering chocolate dipped strawberries that will have you licking your lips in anticipation. 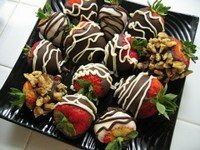 If you don't want to go to the trouble of making your own (although it is quite easy and fun), you can order yourself a truly gourmet selection or splurge on someone else with unbelievable chocolate covered strawberries from some of the marvelous choices below. When making chocolate covered strawberries choose 2 pints of large ripe, unblemished fruit that has a nice aroma. Rinse the strawberries and place on paper towels until completely dry. Line cookie sheets with waxed paper. Melt 1 lb. of bittersweet or white chocolate, tempering the chocolate. Hold a strawberry between your thumb and forefinger and dip into the chocolate with the pointed end down. Cover 3/4 of the berry. Gently shake off excess chocolate and place on waxed paper to set. Serve within 4 hours or chill until 15 minutes before serving. *** However you decide to decorate your chocolate covered strawberries, they will, no doubt, be a hit. Be sure to grab some for yourself before they are all gone. They never hang around for long.